Note: The 1045_1B is identical to the 1045_1, except that you have the option of whether you want to include the USB cable. The 1045 is an intelligent non-contact temperature sensor with a 10° field of view and a USB interface for easy connection to your computer. It takes an average of the temperature of objects placed within its cone of detection. The 1045 outputs a continuous data flow every 32ms with an active alarm running in the background. ; the temperature output data for distant objects ranges from -70°C to 380°C. This particular revision of the 1045 has the circuitry placed on the reverse side of the board, to reduce measurement errors caused by self-heating. 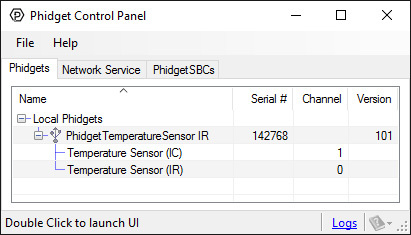 Connect the PhidgetTemperatureSensor IR to your computer using the USB cable. Now that you have everything together, let's start using the 1045! In order to demonstrate the functionality of the 1045, the Phidget Control Panel running on a Windows machine will be used. Linux users can follow the getting started with Linux guide and continue reading here for more information about the 1045. The measured temperature can be seen next to the Temperature label. Point the IR aperature towards a warm object to see the temperature quickly rise. 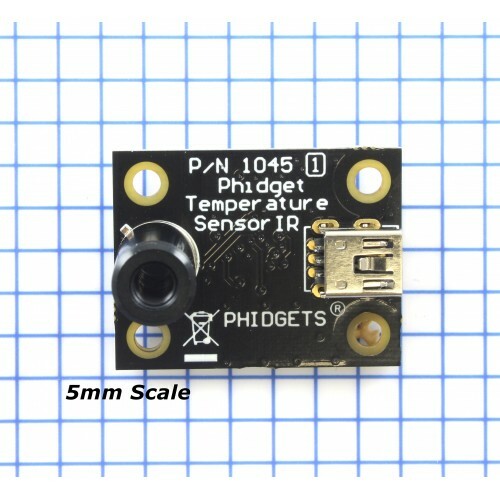 This Phidget is compatible with the TemperatureSensor Examples. The 1045 is factory calibrated in wide temperature ranges: -40°C to 125°C for the ambient temperature and -70°C to 382.2°C for the object temperature. 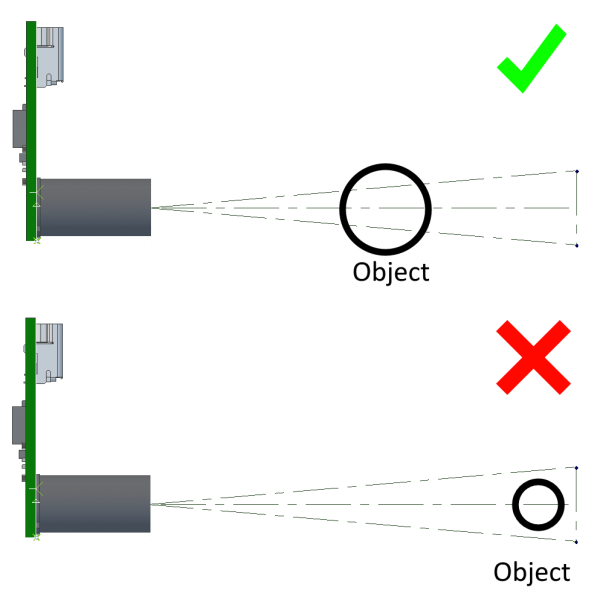 To get an accurate reading, it is important that the object being measured occupies the sensor's full field of view of the sensor while not making physical contact with the sensor. 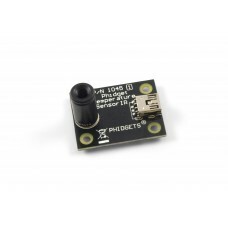 Since an infrared sensor measures temperature based on what the object is emitting, there is theoretically no limit to the range of such a sensor, except that the further away from the sensor the object is, the larger the area of detection is. If the object being measured doesn't occupy the full area, the emissions of other objects could reduce the accuracy of the reading. In addition, the temperature of the object and of the environment also affect the overall accuracy. The highest degree of accuracy is ±0.5°C when both the ambient temperature and the object temperature are between 0°C and 50°C. As either temperature changes, the accuracy can decrease to up to ±4°C. 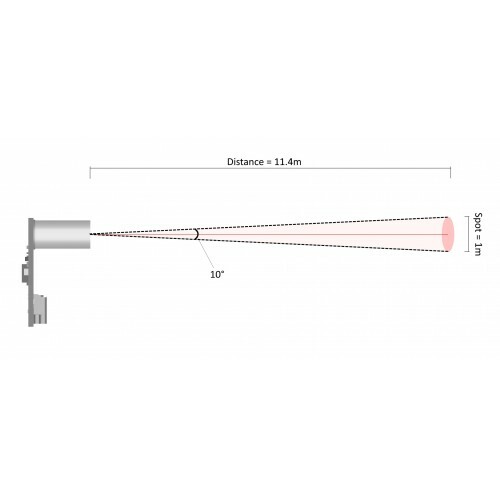 The measured value is the average temperature of all objects in the sensor's 10° field of view. hot electronics behind the sensor. heaters/coolers behind or beside the sensor. hot/cold objects very close to the sensor that not only heat the sensing element in the 1045 but also the 1045 PCB. The 1045 assumes that the ambient temperature has settled to a constant temperature. If the surrounding temperature is constantly changing, or if there is a difference of temperature across the sensor package, additional infrared radiation will be sensed which can result in temperature errors outside of the calibrated errors. In order to measure temperature using infrared radiation, it is absolutely essential to know the emissivity of the surface being measured. Emissivity is a measure of how effective a surface is at radiating energy. An emissivity of 1 is the most effective radiator - for a given temperature, it will radiate the most heat. The 1045 assumes that the surface being measured has an emissivity of 1. If the 1045 is used to measure a surface with an emissivity of 0.5, the measured temperature will be 50% of the difference in temperature between the board and object. 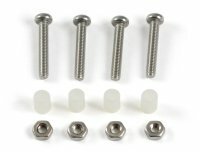 A few examples of some materials with a large difference in emissivity are aluminum, with a typical value of 0.18, and plastics, which can have a value ranging from 0.85 to 0.95. The visible colour of the object does not necessarily mean it has a higher emissivity value. A heavily oxidized aluminum object has an emissivity value of around 0.3, even though it looks very dark. The closer the value is to 1, the better the object is at emitting radiation. The 1045 is calibrated for an object emissivity of 1. A good resource of emissivity values of different materials can be found on here. Emissivity is a complicated topic, as it can vary depending on the temperature of the material. For precise measurements, you may have to calculate the emissivity of your material by comparing the reported Sensor Temperature to the actual surface temperature measured with a contact thermocouple. IR measurements are true surface temperature measurements. For example, when measuring the temperature of a person, the actual temperature measured by an IR thermometer will be temperature of the clothing and not the skin temperature. Emissivity of the clothes is another issue that has to be considered. 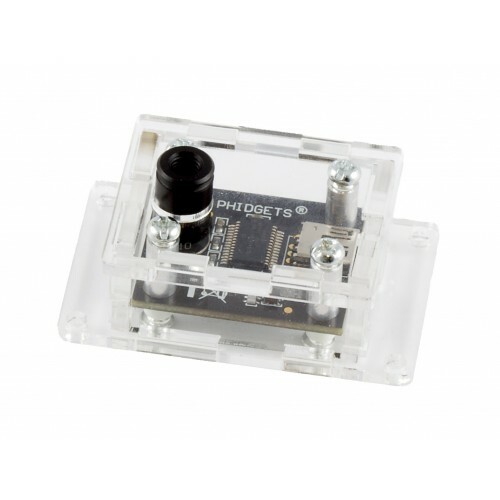 The Temperature Sensor also contains a built-in optical filter to cut off the visible spectra and increase immunity against errors introduced by any surrounding light sources. The wavelength pass band of this optical filter is from 5.5μm to 14μm. Note that this means that you can measure the temperature of objects from any distance provided the object is of sufficient size. This is a bit counter-intuitive but true. You could measure the temperature of the sun from 7.9 million kilometers away though the data would admittedly be about 26 seconds old.